Many Sting fans will be pleased to hear that long time guitarist Dominic Miller has a new album out on March 6 entitled 'November'. To coincide with the new album his website has a fresh new look and you can currently hear the title track from the new album on his home page. 'November' is also available to pre-order direct from Q-rious in both CD and double vinyl formats. The strictly limited double vinyl release - which will not be reprinted - comes with the three bonus tracks. The track listing for 'November' is: Solent / w3 / Still / Gut Feeling / Ripped Nylon / Racine / Sharp Object / Chanson I / Marignane / Chanson II / November / *November (Reprise) / *Bachiana No 5 / * Chanson (Reprise) * Vinyl Release only. 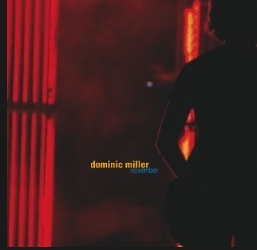 There's a surprise in store for all those who have been Dominic Miller's fans from early on. Whereas up to now he has been mostly admired and hailed for his exquisite acoustic sounds produced with a nylon guitar, the artist now baffles both the audience and experts with the first electronic album of his solo career. His latest release, 'November', offers plenty of space for the electric guitar. Some of the tracks show the more rock-oriented side of Miller, with an at times astonishingly powerful sound. Living proof are tracks like the literal slammer 'Rippled Nylon' or 'W3', steeped in fuzz. To reach this goal, Miller briefed all the colleagues involved: 'Don't give me any personality and let the tunes play themselves!' It was not at all easy to find musicians willing and able to go along with these wishes. But finally Miller found session partners in drummer Ian Thomas (Eric Clapton, Seal, Paul McCartney, Tom Jones), bass player Mark King (Level 42; uncontested master of the slap bass) and keyboarder Mike Lindup (equally known through Level 42), who agreed to put their egos last. To this core of musicians he added Israel-born pinaist Yaron Herman, who now lives in France, as well as keyboarder Jason Rebello (Sting), flutist Dave Heath (a renowned composer of flute, violin and oboe concerts) and sax player Stan Sulzmann (Kenny Wheeler, Michael Brecker, NDR Big Band) - all of them well-versed top professionals who put their distinctive musical personalities on the back burner and devoted their skills uniquely to Miller's compositions. With these devoted sidemen to back him up, Miller created an instrumental album that presents all kinds of unexpected turns, stylistic variations and distinctly innovative sound combinations. Rock ('W3', 'Ripped Nylon'), New-Age meditations ('Still'), lounge music ('Solent'), soundscapes ('Gut Feeling'), funk ('Sharp Object'), references to classical music ('Chanson II') and jazz moments ('Marignane') are moulded into an indiosyncratic style of contemporary instrumental music. 'November' adds another highlight to Dominic Miller's impressive artistic biography. Born in Buenos Aires to an American father and an Irish mother, he studied guitar at the renowned Berklee College, Boston, as well as the Guildhall School Of Music in London. Miller released several solo albums ('First Touch', 'Second Nature', 'Third World', 'Fourth Wall') and since the late 1980s has also been a much coveted session musician. The list of his collaborations is sheer endless - to name but a few: The Chieftains ('Long Black Veil'), Eddi Reader ('Mirmama'), Manu Dibango ('Wakafrika'), Paul Young, Bryan Adams, Luciano Pavarotti, Peter Gabriel, Pat Metheny, Tina Turner ('Wildest Dreams'), The Pretenders, Boyzone and The Backstreet Boys. Ever since 'The Soul Cages' from 1991, Miller has been involved in every album by Sting; he has played more than a thousand concerts with the former member of The Police and was involved in the composition of hit songs such as 'Shape Of My Heart'. With 'November', Miller yet again proves that he is a top-notch guitarist. The exceptional musician plays with an ease and somnambulistic confidence that words simply cannot express appropriately. His willingness to move beyond his artistic skills is what distinguishes him from other virtuoso contemporaries - Dominic Miller has moved on from the level of 'mere' skillful performance and perfected craft. These days, he is more focused on expression, on the beauty of a certain sound and the truth of the moment. His transcendence of the physical is a trait that singles him out as one of the chosen few. For more information visit his site at www.dominicmiller.com and check out his facebook site at http://www.facebook.com/pages/Dominic-Miller/.